Natural lighting can add a comforting feeling to your home, and can create more light in what would normally be dark places in your home. Natural lighting can have a variety of benefits for your home, and Your Door Our Glass can easily transform your doors in your house into beautiful, decorative glass doors that enhance natural lighting in your home. We carefully take a portion of your door and insert a beautiful glass piece, effectively and efficiently. In this blog post, we’re going to explore how glass doors enhances natural lighting and the benefits they provide. Not only can you enhance your front door’s natural lighting through our glass installation, but you can also enhance your back or side door that leads outside, by having us install our glass-allowing daylight to come through. We are experts in carefully deconstructing your current door to insert a variety of glass that matches your preferences and desires. 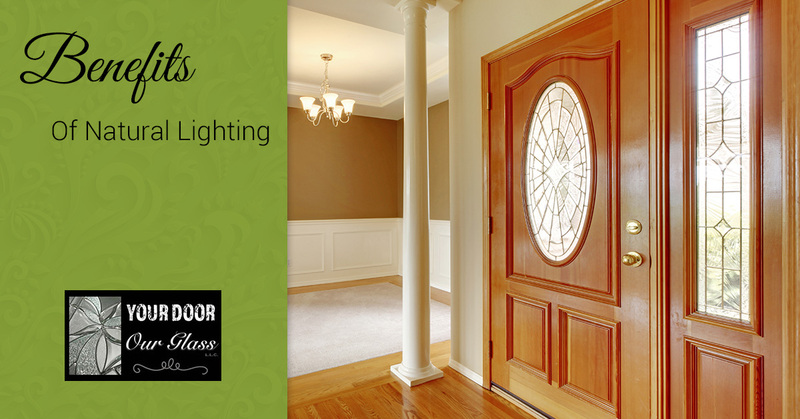 Any door has the potential to be a gateway for natural light to shine vibrantly in your home. Certain areas in your home are dark, but with a glass door installation, they no longer have to be! This can help you save unnecessary spending on energy bills to light up a certain part of your home. Think about it – you go to let your dogs out the back door, but your back door offers limited to no lighting, so you turn on your lights. You let them out, and the next thing you know the light is left on for hours. That costs you money. But, with a glass door, you can eliminate the need to turn on that light with the natural lighting that shines through the door. Also, natural lighting can help produce energy savings by allowing you to use less heat or air conditioning. If you have an office in your home, or your back door near your kitchen doesn’t allow for light to come in, installing a glass door and enhancing natural light can help make you happier. Natural light helps combat the unnecessary sadness that comes with dark areas, and can provide the mental and visual stimulation- increasing your overall mood. We humans love the feeling of sunlight, and natural light can help create a lot more comfort in your home through the addition of that little bit of sunlight. By installing a glass door, you can add a comfortable aesthetic and feel within your home. It can illuminate a part of your home to increase the beauty of a space, as well as make the space look larger. With the variety of designs, as well as custom designs offered at Your Door Our Glass, you can spice up the look of your home and add design. This can have positive effects on how you feel about your home, as well as the value and its curb appeal. 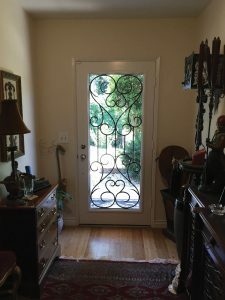 Don’t wait to get a new glass door, or spend unnecessary money on a whole new door, let Your Door Our Glass take your existing door and beautify it! Contact us today for a consultation!